I have been obsessed with the color pink lately, all shades of it really. And ever since I saw that picture from Fashion week of That Girl in the hot pink suit I knew I needed to find some perfectly Pink pieces. 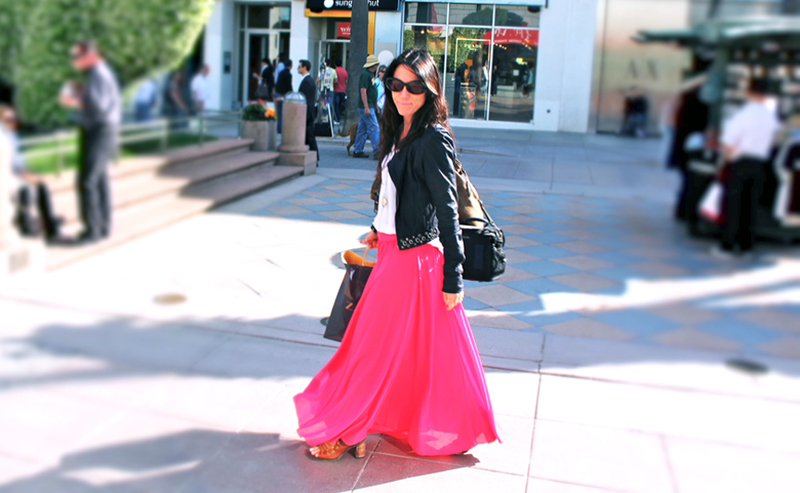 Then one day out of the blue, at my local Anthropologie a woman returned this hot pink chiffon maxi skirt in my size. And yup, you guessed it I snatched it right up. Camilla and I went shopping in Santa Monica this past Friday and stopped off at Zara for some great finds. Wearing her new eyelet cropped cami from Free People and denim shirt and jeans from Urban Outfitters. We found this amazing pink dress and shoes. If you are wondering why Camilla is covered in band aids, it's because she took a tumble on her bike, her last week at school. 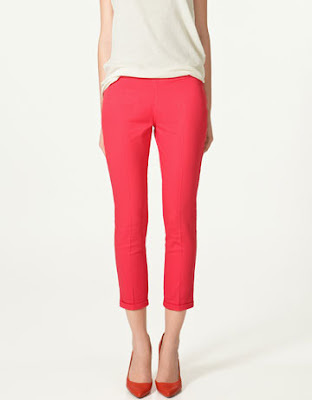 Camilla ended up buying these perfect fitting hot pink pants. And I found the pink blazer I had been looking for in a cotton pique fabric so it almost looks a bit vintage. Sorry, but we had to end by putting up this video from the movie Funny Face. It was a little too fitting for the post and Kay Thompson's character as the editor of a high fashion magazine was most obviously inspired by Diana Vreeland of Vogue. that is what i love about a true stylish fashionista. she can wear something not all that expensive and makes it look like a million dollars. the dress is magnificent. it is hot pink, but the right pink. when people say pink you start to think about the wrong color, but oh no, this is perfect. love the combination with the shoes, it is not too much. but just perfect. love the video. great post girls. that is a beautiful pink skirt, and i've been searching for this exact pink blazer. no zara here! take care of those legs, camilla! Fantastic photos! Got to love the colour pink! love that pink dress! amazing. the band aid's on your knees make it really cool haha. you both look so amazing! Wonderful, wonderful pink anytime. Pink makes me smile. The pink dress is amazing! And I have the shoes, they're amazing! val and cami i super loooove your blog! this is actually one of the few blogs i followed when i started my blog last month..the mother-daughter tandem is unbeatable.. i just adore your take on fashion and your ability to glam up even the simplest stuff.. hope to meet both of you someday..lol..kisses! Amazing blog! I like it! Pink is my FAVORITE color!! I love that pink dress on Camilla. It is so beautiful and she looks amazing on it (bandaids and all, hehe). I LOVE the hot pink dress! gorgeous!! 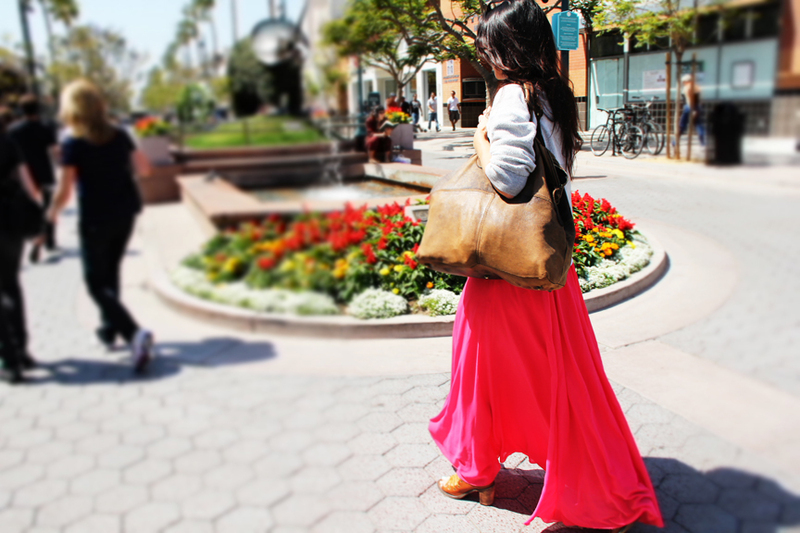 i loveee the pink skirt and dress! amazing color! Love the Navy Leather Jacket ... hot, hot! New follower ;) Can't wait to read more often! Cool post! and pink always is an inspiration...and fabulous to finish with the Funny face" film....so classic! Love the pants and the blazer! Sorry about your fall, Camilla. Glad you're okay, though! I like your blog and the photos are nice too. I really like the pink skirt! I love this tone of pink! Thank you for your reply on my blog about the camera you use. I am actually new to blogging, since I usually write on one of those vintage typewriters in an attempt to keep it old school. However, this whole internet thing is pretty neat, and I'm finding the "backspace" button to be highly useful. Anyway, I've taken the liberty to follow your blog, as I'd like to understand the whole fashion scene better, and you seem to have quite a fashion sense. By the way, if you're a butterfly by day, what are you when the sun goes away? Pink suits Camilla perfectly... really. She can pull off all black and hot pink. Beautious! Thank you for all your love and support on our site. We love stopping by and seeing what you two lovelies are up to. How incredible has freepeople's inventory become! Yowza. Thank you very much for your super sweet comment! I would like to follow each other. looove camilla's heels and pants! you are so pretty! Always love to see you pictures:)!